We’re all part of a “global brain”, nodes in a vast interconnected network of humanity. So says Ross Dawson, author of Getting Results from Crowds. Sharing his perspectives at the recent Crowdsourcing Week here in Singapore, Dawson proclaimed that this ubiquitous connectivity accelerates both openness and creativity, mediated by the social web. The march of machines overtaking the jobs of humans have resulted in the dehumanisation of work. This has resulted in a backlash as jobs are lost (or off-shored), resulting in a re-examining of humanity. To reclaim its meaning, work itself must be reconfigured. It must be restructured to suit the present age and answer the big question of who we are as humans. It must also find a way to fruitfully engage the collective brain juices, emotional energies and abilities of the masses. In a way, seeking inputs from the crowd is a way of putting the human back into the equation. Doing so allows you to reconnect to others in a meaningful an productive fashion. 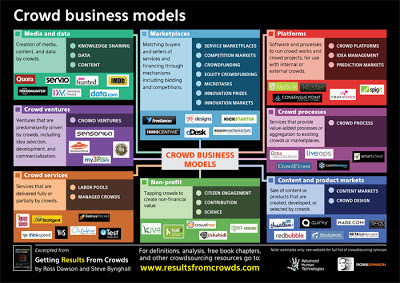 Tapping the minds of many, the crowdsourcing landscape has resulted in the growth of 22 different crowd business models. This can be seen below (click for larger image). By democratising creativity and innovation, advanced economies like the US could address declines in national creativity (read “The Creativity Crisis” for more). To enable crowd innovation, current constraints like intellectual property protection and cultural contexts need to be considered. One should also think about the domains for crowd innovation in areas like product/service delivery, marketing, process, strategy, and structure. In all of these cases, clearly defined outcomes supported by clearly defined task platforms are required. Through distributed ideas development, one can bring many ideas together and create unique value through co-creation. By developing a participatory strategy that encourages open contributions, relationships with fellow ideators can be forged while harnessing their collective wisdom. e) Designating the breadth and depth of crowd participation. In summary, organisations leveraging on the “global brain” need to move from being bounded to becoming unbounded. They need to unleash the cages that surround them and reach out to the vast oceans of humanity and their collective energy, genius and passion.